"Great White Magic, hear my plea! Make this house as it used to be!" 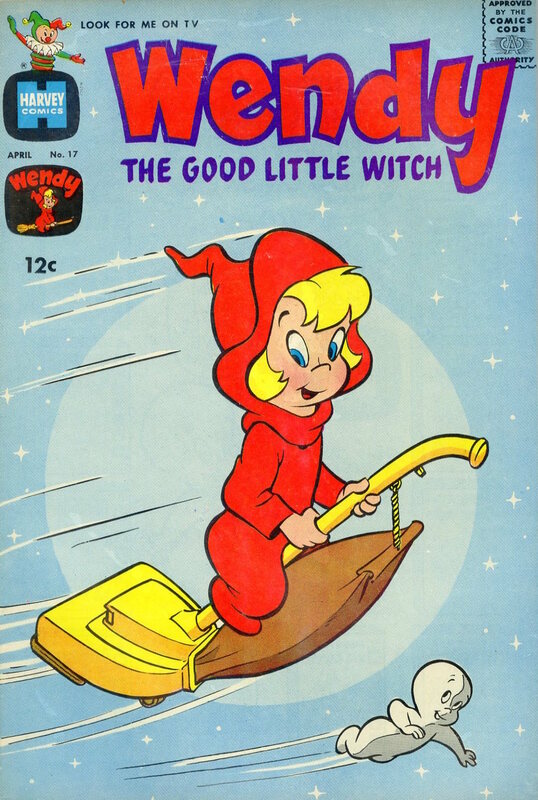 -- Wendy, Wendy the Good Little Witch #49: "The Super Broom"
laughs by having her ride a vacuum rather than a broom. I've seen this same gag with Wendy, the Sandersons in Hocus Pocus and a Saturday Evening Post cover by JC leyendecker. Now I really want to know where the trope of riding a broom came from in the first place. That's an interesting question with a fascinating and risque answer. Apparently, the broom is a symbol of domesticity that the witches have co-opted for sexual pleasure (since the broom is a phallic symbol) to show not only their rejection of traditional roles, but also their independence from men. I looked it up myself after posting and got similar answers. Now that I know I'm not really sure what I was expecting. I didn't think it would be that deeply rooted in legend. I figured that there'd be some Victorian-era cartoon that everyone copied or something.